There is a bit to get to this week. Hopefully everyone is enjoying the first legitimate week of the summer. It’s June, for crying out loud. How crazy is that? Before you know it, Fargo will be here and then next thing you know, it’s August with the Olympics right around the corner. Life happens quickly, might as well enjoy it while it’s here. 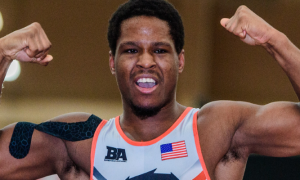 By now you likely know what went down at the University Nationals and the dominance exhibited by the Northern Michigan athletes. The NMU boys ran roughshod over the event, putting someone from that room in the finals at all nine weight classes and coming away with five championships. Part of the news obviously was about Dalton Roberts (NMU-OTS) and Alan Waters (Missouri). This is not a sketchy area, so it is confusing why it is being treated like one. Dalton Roberts is a Greco Roman wrestler who was wrestling in a Greco Roman match doing Greco Roman things. Waters, if you don’t know, is a super talented athlete and had a terrific career in college at Missouri. In any style of wrestling, Waters can figure out how to score points. He has that kind of ability. But he was clearly not familiar enough with the rule set. Greco isn’t like everything else. It doesn’t encourage contact, it outright demands it. You need to know that going in. And anyone who has watched Roberts wrestle knows that the kid comes forward the entire time. He’s always in the fight. As a matter of fact, if you know anything about Roberts, it should be that piece of information. Roberts pressed and pressed. He might not have piled up the tech points, but he kept to his strategy and it worked. The undersized 59’er stuck to his guns, maintained his poise, and was still standing at the end. Roberts won that match every bit as much as Waters lost it. Case closed. How about Austin Morrow (NYAC/NMU)? Morrow took fifth last year at this tournament but was an altogether different kind of beast this time around. He looked faster, stronger, and in control. Jessy Williams (NYAC/NMU) had a good day, as well, but Morrow really stood out not just because he won, but how he went about his business. What happened on Friday has to be a confidence booster for the 22-year old going forward. Also – Morrow has set up a GoFundMe to help off-set his cost to train and compete at the World Championships. Once again, if you can chip in, please do so. How are we supposed to even label G’Angelo Hancock (NYAC, 98 kg) at this point? He’s only 18, on three separate National teams, and is just starting to bloom. 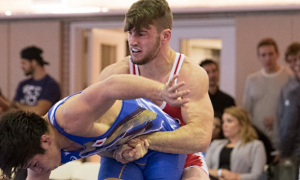 Orry Elor (NYAC/NMU) is a rugged, accomplished athlete who also has a bright future in front of him, but in the few matches these two have wrestled each other, Hancock looks like he is simply on a different level. And he is. Hancock is certainly one of the top three young talents in this country and watching him utterly destroy the competition in Akron was yet again an eye-opening experience. 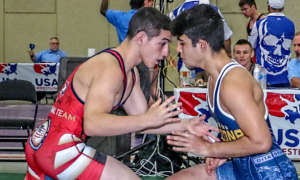 It’s painfully obvious that Mosha Schwartz (Colorado, 46 kg) is going to be a problem for any potential opposition for a long time as he continues to advance through the age group levels. What can this kid not do well? He’s as authoritative as a 28-year old vet out there and best of all, he loves to score. Loves it. It’s all he wants to do. Sure, he was probably supposed to dominate going in, but that doesn’t make his storm through the tournament any less impressive. Best of all? He’s so keyed into Greco right now and although he has talent for days in other styles, here’s hoping his World Championships experience this year continues to lead him down the Greco path. Peyton Omania (California) and Calvin Germinaro (Minnesota) provided a best-of-three that gave fans a taste of everything. 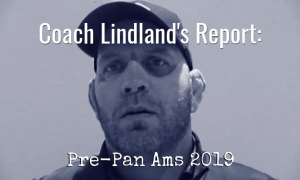 The first match of the 63 kg series allowed for an in-depth look at each athlete’s abilities: Scoring, tense exchanges, and more scoring. Omania got out of that one with a 14-12 win. In the second round, Germinaro got on a roll (almost quite literally), and cruised to an 8-0 tech. 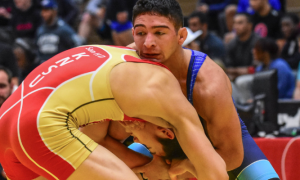 But wouldn’t you know it, Omania came out in the third and final match with a dose of exacting payback, tech’ing Germinaro for his own 8-0 victory, clinching the title and his spot on the Cadet World Team. 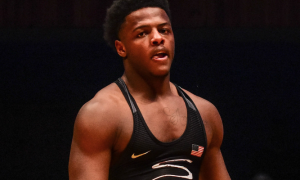 Omania, who trains out of the CYC in Concord, California, entered Akron coming off a great performance at the Junior World Duals last month, so he must have been pretty encouraged as to what he was capable of heading into the tourney. 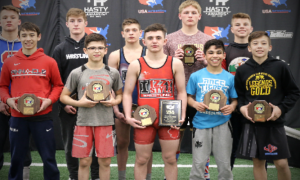 Another athlete who wrestled at the Concord Junior Duals, Clay Lautt (Kansas), also had himself quite a day at the Cadet Nationals. Minnesota’s Jake Allar, a gifted wrestler with a world of promise in his own right and tabbed as a favorite in this weight, was upset by Jose Acosta (Wisconsin) in the semifinals. Acosta basically exploded through Allar, setting up his showdown with Lautt. The first bout in the best-of-three was a tension-filled 2-2 criteria win for the Kansan. Things wouldn’t be so close in the second match, as Lautt got on a run to pile up some big points. It all unfolded rather quickly, as it tends to do, and at the end of it, Lautt walked away with a well-deserved World Team spot. The Superior Camp started today at the Olympic Training Site at Northern Michigan University in Marquette. 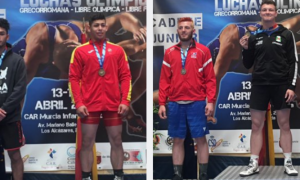 We already touched on why this is kind of a big deal, but it is also indicative of the drive many accomplished Junior and Cadet Greco wrestlers have in this country. Virtually the entire Junior World Team roster will be in attendance, sharpening up and getting work in to further build their foundations towards the summer. It is also a great opportunity for wrestlers who may not have made one of the National teams to get in on the action and pick up a few international training partners in the process. We will have updates and info on the Superior Camp as it progresses. It’s just too important to the development of the style in this country among the age groups not to provide information about. We already posted our “Memorable Match” of the week involving the Dalton Roberts-Alan Waters semifinal bout from the University Nationals. If you haven’t read that yet, do so. It’s Roberts in his own words describing his approach during the match and the sequence that changed everything around. If you want to see other items included in the “Monday Roundup” or have any general questions for us, get us on Twitter, Facebook, or via email – [email protected].